This attempted upgrade didn't work. 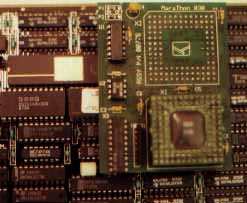 The upgrade part was a Sonnet 68020 to 68030 accelorator built for the Macintosh II series of computers. I had hoped that all it did was convert 68020 signals and then process them faster on the 68030, that appently was NOT the case, and this upgrade resulted in a machine that didn't boot. I attempted to replace the existing 16.67Mhz 68020 with a Macintosh upgrade part that fit in a 68020 socket and replaced the 68020 with a 33Mhz 68030. Had this upgrade worked, it would have given me a signifigant perfromance improvement. Since I had the part lying around, I thought I'd install it and give it a go to see what happened. This required removing the CPU board from the Sun. I'd done this earlier when I'd replaced the 68881 FPU with a 68882. 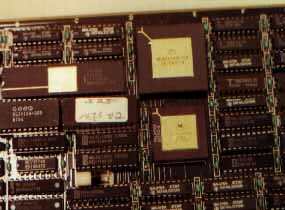 This first photo shows the 68020 and the 68882. 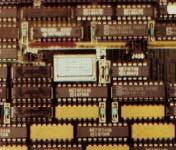 The 68020 is the larger of the 2 square chips. The job required me to pry out the 68020 (quite a trick because there are pins on all 4 sides) in order to insert the Sonnet board into the CPU socket. Removal of the chip involved using a thin metal strip (like the edge of a knife) and gently rocking it back and forth along each side of the chip until the chip was loose enough to be removed without damage to any of the pins. This second photo shows the same area of the CPU board, but with the Sonnet 33Mhz 68030 "marathon" board installed in the 68020's socket. The board's pins are long enough that is sits over the other components of the CPU board, and it obscuring your view now of the FPU and some other parts. As a result, when I slipped the board back into the 3/160, care had to be taken to assure that there was no board in the slot next to the CPU board, as it would have been rubbing against the Sonnet Accelorator. Unfortunately; the entire concept just didn't work. The machine powered on, but there was no booting, and nothing echo'd to the screen. The machine was essentially "hung" in power up mode - as if there were no CPU in it at all. It's a good bet the hardware just didn't recognize the Sonnet board - either due to something proprietary about the Sun or due to whatever microcode might be in the Sonnet board to deal with the Mac and it's ROMs. Contrary to the Sun3, 020 based Macs don't have a MMU chip. the 68020 Sun3 architecture conflicts with the internal one. These last two photos are of the crystal that I'm going to replace for my next "speed-up" trick. This is the 33.33 Mhz crystal, identified on the underside of the CPU board as U403. It's the bright silver box on the component side of the board. replacing that with a higher rated crystal should speed up the clock on the 68020.